The Acer Aspire V3-571 15.6-Inch Laptop is packed with fun features ideal for for everyone at home, school, and office. This beautiful laptop has something to offer the whole family. The Acer Aspire V3-571 is a powerful laptop with a 2.5GHz Intel Core i5-2450M processor and 6GB of RAM. It doesn't have an integrated graphics processor, but its on-chip Intel HD Graphics 3000 GPU can handle some 3D games at low quality settings. We achieved a frame rate of 18fps in our Dirt 3 test at high quality, 4x anti-aliasing and a resolution of 1,280x720. That isn’t smooth enough to play the game, but the frame rate improves if you drop the quality settings a little further. A dedicated graphics processor will do a better job, but this is very respectable performance for an integrated graphics processor. We were impressed by its performance and raw processing power in our other benchmarks, too. The V3 got an overall score of 58 in our benchmark tests, making it more than powerful enough for any standard desktop application, even if you like to work with multiple programs and tabs open simultaneously. Its 6GB of memory stands you in good stead for image, video and audio editing, too. Surprisingly, given its power, the V3’s battery held out for an impressive 6 hours and 44 minutes in our tests. The Aspire V3-571 is rather chunky in this age of ultra-slim Ultrabooks, some of which have a similar screen size, but with the extra size you get a lot more power, extra storage and a slightly lower price for not too much more weight or bulk. 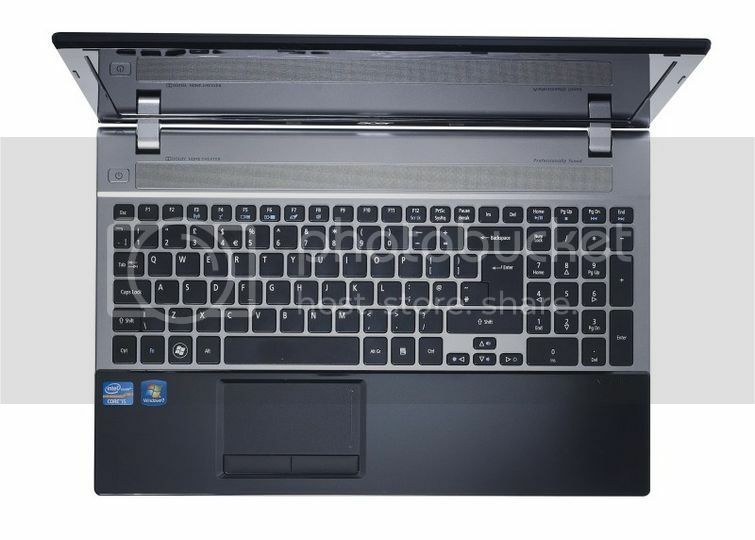 The laptop's styling involves a pleasingly inoffensive combination of a metal plate around the keyboard and shiny black plastic on the cover, bezel and wrist rest. The plastic picks up fingerprints and smears easily, but it wipes clean. The keyboard has flat, widely spaced keys but it's comfortable to type on and provides a good sense of contact and movement when you strike the keys, unlike some other laptops that have adopted this style. Unfortunately, we found it easy to brush the touchpad with our wrist or the edge of our hands as we typed, accidentally moving the cursor to random locations in the document on which we were working. The wrist-rest also became a little warm at times, but not uncomfortably so. The V3-571 has a 500GB hard disk that provides plenty of space for work, software and media. If you need to add external storage, there’s one USB3 and two USB2 ports on the sides, as well as a memory card reader that supports most common high-capacity formats. A DVD-RW drive rounds out your storage options. The V3 also has a Gigabit Ethernet port, dual-band 802.11n Wi-Fi and Bluetooth for connecting it to your network. Its 15.6in LCD screen is particularly good, although the glossy finish can produce distracting reflections if you're viewing dark screens in a brightly lit room, the brightness, pure white tones and intense colours of the display make up for that. If you want to connect an external monitor, TV or projector, HDMI and VGA ports are both available. The integrated speaker is fine for system sounds and spoken audio, but it's not very loud, has no discernible bass and very muddy rendition of mid-range tones, so you'll need external speakers if you want to listen to music. With new USB 3.0 you can transfer a transfer a 250GB movie in 70 seconds! USB 3.0 works up to 10x faster than older USB 2.0--and you can even charge your USB devices when your laptop is asleep, hibernating or off! Bulk Email marketing have a direct contact … Email Marketing | Email Campaigns Online resource for Bulk Email Marketing Services, Email Marketing Campaigns, Email List Builder, Permission Email Marketing, Email Marketing Reports.